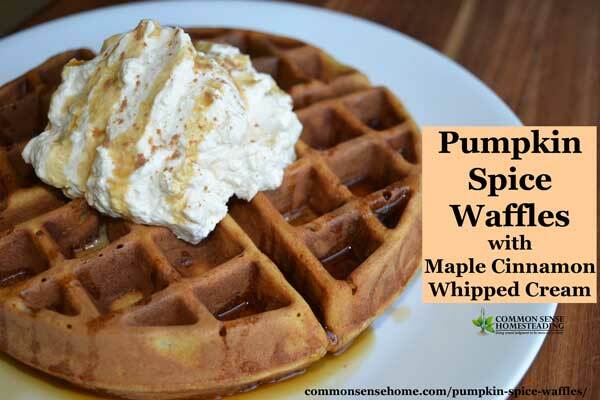 In honor of “pumpkin spice everything” season and the fall abundance of squash and pumpkins, I wanted to share this recipe for pumpkin spice waffles with maple cinnamon whipped cream. 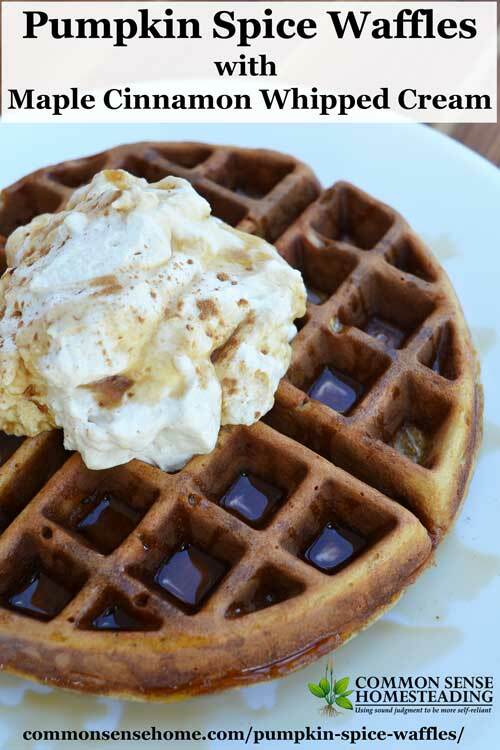 The pumpkin spice waffle recipe is adapted from the Wisconsin Pure Maple Syrup Cookbook by the Wisconsin Maple Syrup Producers Association. They recommend serving it with pure maple syrup – which is indeed tasty – but the maple cinnamon whipped cream is not to be missed. (You may be tempted to eat it straight with a spoon!) Alternatively, some applesauce or spiced, cooked apple slices would also be lovely. Peanut butter or nut butter could be used for extra protein. Preheat and oil waffle iron. Combine dry ingredients in a large bowl. In a medium sized bowl, whisk together wet ingredients. Pour wet ingredients into dry and whisk until just blended. Ladle or scoop batter into waffle iron and cook until crisp. Serve immediately with maple cinnamon whipped cream or your choice of toppings. Makes around 5 large, round waffles. Note: You may use use commercial canned pumpkin puree or home cooked pumpkin. Many squash varieties produce darker, drier, sweeter flesh than pumpkins, so I prefer them for cooking. To prepare pumpkin/squash puree, cut the fruit in half and scoop out seeds. Place the fruit cut side down in a large pan with about an inch of water. Bake at 350°F until a fork easily penetrates the flesh of the pumpkin, about 1 hour for a medium squash. Scoop soft flesh out of pumpkin shell and use within 2-3 days or freeze for longer storage. With a stand mixer or whisk, beat cream until soft peaks begin to form. Add syrup, sugar, vanilla and cinnamon. Continue beating/whisking until stiff peaks form. Use immediately or refrigerate and use within 24 hours for best quality. If you love the flavor of pumpkin spice, you can make up your own homemade pumpkin spice blend to use in this and other recipes. Mix together all ingredients and store in an airtight container such as a small mason jar or spice jar. 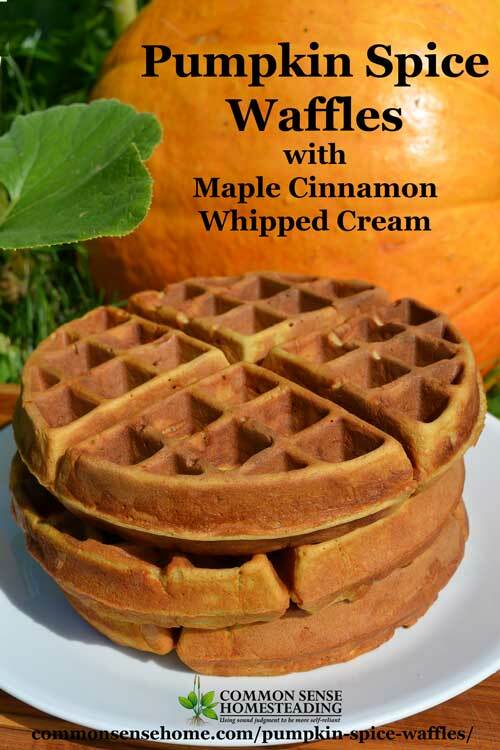 To use in the pumpkin spice waffles, simply substitute 2 tablespoons of this blend for the cinnamon and other spices. Here's how my youngest likes to eat his waffles. 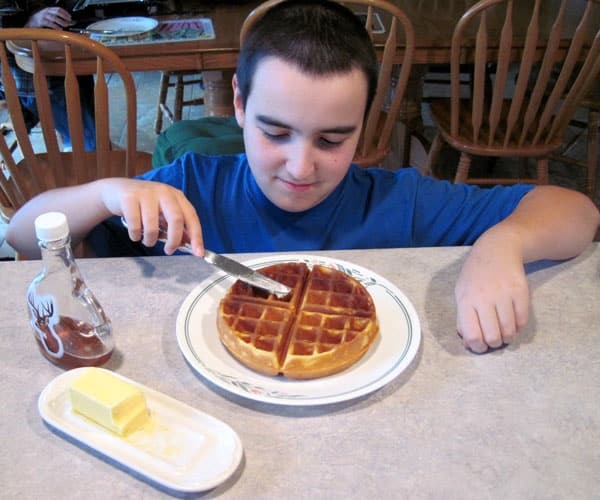 First, apply a dab of butter in each waffle divot, and then apply a drizzle of real maple syrup over the entire waffle. See “How to Cook Pumpkin or Winter Squash – 3 Easy Methods” for tips on making your puree. PS – This is the squash harvest that originally inspired this post – butternut, buttercup, Speckled Hound, Galeux D Eysines, Long Island Cheese, Marina di Chioggia, Lady Godiva, spaghetti squash – we were overrun with squash and pumpkins in 2012. 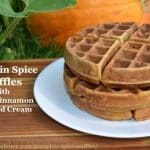 Pumpkin spice waffles pair up a favorite fall flavors, abundant pumpkin and rich whipped cream for an easy but memorable breakfast treat. You may use use commercial canned pumpkin puree or home cooked pumpkin. Many squash varieties produce darker, drier, sweeter flesh than pumpkins, so I prefer them for cooking. To prepare pumpkin/squash puree, cut the fruit in half and scoop out seeds. Place the fruit cut side down in a large pan with about an inch of water. Bake at 350°F until a fork easily penetrates the flesh of the pumpkin, about 1 hour for a medium squash. Scoop soft flesh out of pumpkin shell and use within 2-3 days or freeze for longer storage. Originally published October 2012 as “squaffles”, updated 2016. Wow, that is a lot of squash! With all of the extra nutrition you can sneak into your baking this winter, your family should be strong and healthy for the winter. I had no idea there were quite so many until we did the final harvest, but I’m looking forward to using and sharing the bounty. Lucky for you that there are lots of spaghetti squash. They last months! Your family should be able to enjoy plenty of warm squash recipes this winter. I recently tried something similar with shredded yellow squash. I added 2 cups of shredded squash to my sweet buttermilk cornbread batter. baked at 360 for 40 minutes to perfection. Warm wishes to you and your readers this Fall. Yes, spaghetti squash are some of the best keeping squash you can grow, and with their neutral flavor they blend into almost anything. So what kind of squash do you recommend for this recipe? I was thinking maybe butternut and I’ve made waffles with pumpkin before… but what else would work well? This time I made it with Galeux D Eysines, but any sweet squash or pumpkin would work. I’ve become more of a squash fan over the years, because (in general) their flesh tends to be sweeter, darker and denser. 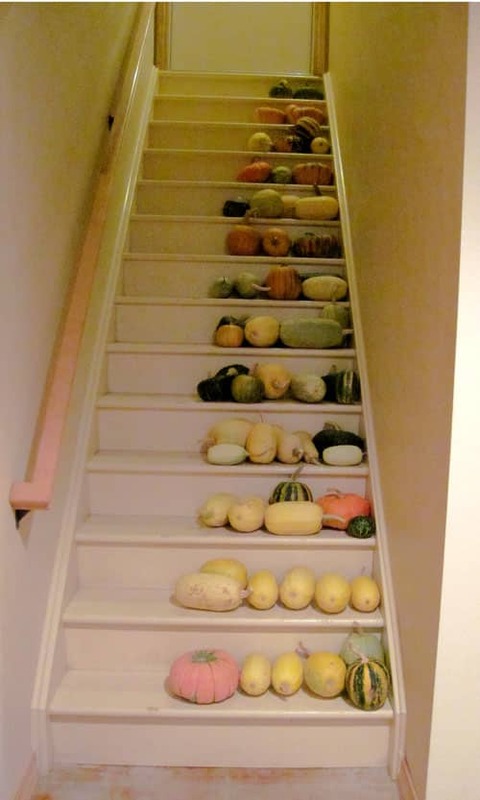 Love to see all those squash on your basement stairs!